The fractious and prolonged Brexit debates have led to heightened scrutiny and coverage of the role of Speaker of the House of Commons. 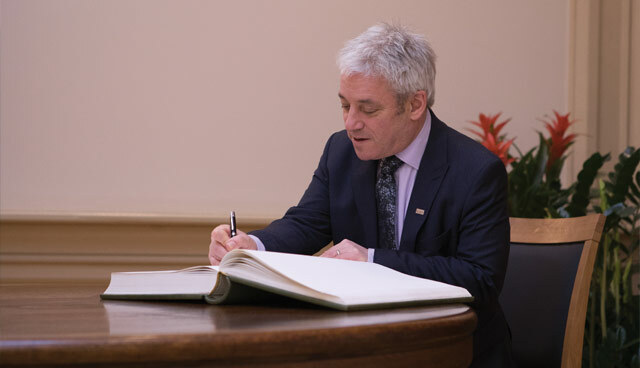 The position has been occupied by John Bercow, MP for Buckingham originally elected as a member of the Conservative Party, since 2009. agendaNi examines the role of the Speaker and the precedents and bylaws that have informed his recent decisions. Speaker Bercow recently caught the media’s attention by casting the deciding vote to block a series of indicative votes on Brexit in late March. Following a parliamentary tie, where MPs voted 310 for and 310 against, Bercow cast his vote with the ‘noes’, explaining that he was duty-bound to do so because “it is not for the chair to create a majority which otherwise does not exist”. In doing so, Bercow cited the precedent of former Speaker Betty Boothroyd casting a decisive no vote in the Maastricht Treaty debates of 1993. However, on that occasion, it was discovered that an extra vote on the ‘aye’ side had been mistakenly counted and the Speaker’s vote had not been decisive. The last truly deciding vote cast by a Speaker was cast by deputy Speaker Sir Paul Dean in June 1990, when he voted with the ‘noes’ after a tie on an amendment of the law relating to the termination of pregnancies. Bercow also made headlines earlier in March and drew the ire of some Brexit supporters by blocking the possibility of a third vote on Prime Minister Theresa May’s withdrawal agreement. In doing so, Bercow cited Erskine May, the Parliament’s official handbook begun by Thomas Erskine May, a constitutional theorist and Clerk of the House of Commons, in 1844. Page 397 of Erskine May states that a motion or amendment that is “the same, in substance” as a previously defeated motion or amendment may not be brought forward again within a session or parliament. Bercow detailed how Erskine May outlined the precedent in this decision that stretched back as far as 1604; the rule was also used to block a repeat vote on women’s suffrage in 1912. The Speaker conceded after a question from Conservative MP Alex Burghart that, to get around his ruling, the House of Commons could simply suspend the standing orders that bar the possibility of repeat votes. Another possible step for the Government to pursue, had they been wishing to force through a third vote, would have been to prorogue and then restart Parliament, creating a new session. Such a measure would be “unusual” according to Bercow, but it does have precedent in the Clement Attlee-led Labour Government of the 1940s, who prorogued the session in order to pass the 1949 Parliament Act after it had been blocked by the House of Lords twice. The Speaker of the House is the “highest authority of the House of Commons” and has final say over how parliamentary business proceeds, including the decision over which tabled amendments will be selected for voting. Despite being an elected MP, and thus having political convictions of one form or another, the Speaker “must remain politically impartial at all times” and represents the House to the monarch, the Lords and all other authorities. The Speaker also chairs the House of Commons Commission. Bercow was elected as Speaker in 2009 after the resignation of Michael Martin. Upon election, the Speaker must surrender his party membership and should he or she wish to carry on the post after a general election, the Speaker is traditionally left unchallenged in their constituency by the major parties. As such, Bercow has been returned as an MP and then elected unopposed as Speaker in the 2010, 2015 and 2017 general elections. It is said that Bercow plans to retire in 2022, at the end of the current parliament; it has been mooted that the Cabinet plan on denying him a peerage, typically a formality for a retiring Speaker, due to what has been seen by some as “bias” during the Brexit debates. Bercow has done away with the traditional court dress outfit of knee breeches, silk stockings and buckled court shoes under a gown, and a wig, preferring instead to wear a suit. Having originally removed the gold frogging from the sleeves and train of the Speaker’s black silk gown, Bercow returned to the traditional design in 2016. Betty Boothroyd was the first Speaker of the House to dispense with the wig. Accusations of bias against Bercow were perhaps at their loudest in January 2019, when he defied the advice of the Commons’ clerks by allowing a vote on an amendment tabled by Dominic Grieve MP that stated that should the Prime Minister’s Brexit deal be rejected in the Commons, she would be obliged to return with a Plan B within three days, where previously she would have had three weeks to do so. Bercow’s decision had no previous precedent and whether it becomes a once-off ruling or a precedent setter will be up to his successor as Speaker. The Government argued that the decision allowed backbenchers the ability to set the Commons’ timetable rather than the Government itself, but as the Speaker is the final arbiter of the Commons’ rules, Bercow’s decision was final. Bercow has also allowed a large uptick in the number of ministers being held to account, a parliamentary mechanism whereby backbenchers can summon ministers to Westminster at short notice at the discretion of the Speaker. 12 ministers were held to account in his first year as Speaker, but the Parliament has averaged 50 per year since then. Bercow’s independence and interpretations of Erskine May have caused frustration for his former party colleagues and it will be interesting to see, should Brexit come to pass before the end of the current Parliament, whether the Speaker stays in his post until 2022 as he intends.